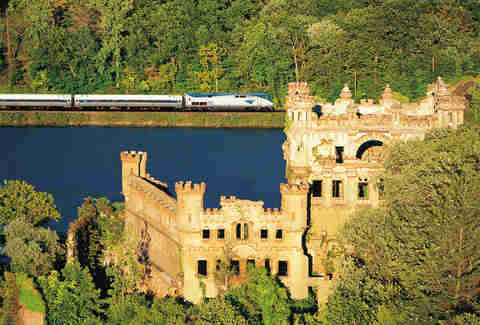 Despite what you think you know about train travel -- it's slow, expensive, and prone to robbery by masked men on horseback -- Amtrak's got two key selling points: A) it ain't as bad as a bus, and B) in this era of soul-crushing air travel, it's fairly plush compared to flying coach. There's leg room, power outlets, a bar car (!!! ), and ridiculous views of the American landscape you simply can't get at 30,000ft, or from the basement of the Port Authority. Here are our five favorite legs. Assuming you don't need to be at Club Supersexe for your buddy's bachelor party, like, today, hop the only East Coast route to crack the list and meander up the Hudson River past West Point, an abandoned island castle that once served as an arsenal, and Lake Champlain, before rolling into Montreal for an epic weekend of poutine and Labatts. How much? Fares from around $65 each way. Bargain! Leave in the morning and pull into Montreal just after happy hour. 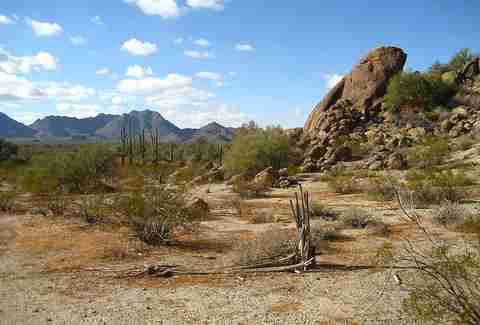 In no way related to the 2011 made-for-TV movie (based on the Cormac McCarthy play) featuring Samuel L. Jackson and Tommy Lee Jones, our southernmost route is dotted with tumbleweeds, cacti, and ornery Arizonians angry about immigration policy. It loosely follows the US-Mexican border and passes through Tuscon and El Paso en route to the Big Easy. How much? Fares from around $160. But be forewarned -- the trip takes nearly 46hrs, so you'd better not be in a big hurry. When was the last time you heard someone complain about the view while cruising down California's Pacific coast? Never, right? Well, not only do you get those sweeping vistas, you'll also be Instagramming Mt. Rainier and Mt. St. Helens, then riding through 22 tunnels cut into Oregon's Cascade Mountains. How much? From about $115. The journey'll take you two days and one night. While the Zephyr actually originates in Chicago, the leg from Denver to the Bay's your move (unless you enjoy looking at corn, which is also fine). 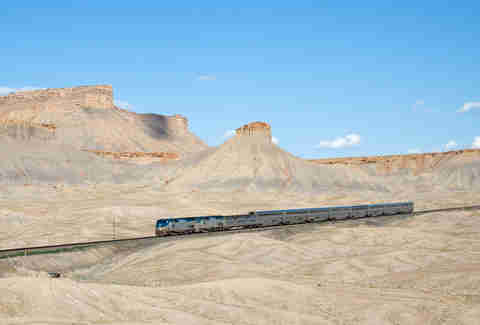 It follows the Colorado River through the Rockies and will blow your mind as it rolls through Ruby Canyon, the red rocks of Utah, and Donner Pass in the Sierra Nevadas. How much? From about $140, and the better part of a day and a half. Three words: Glacier National Park. A million acres, two mountain ranges, and, wait for it… glaciers (!!!) 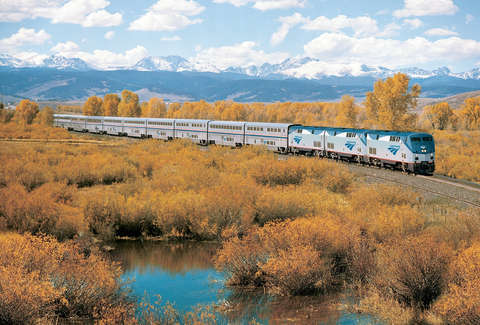 are hands down what make the Empire Builder number one. 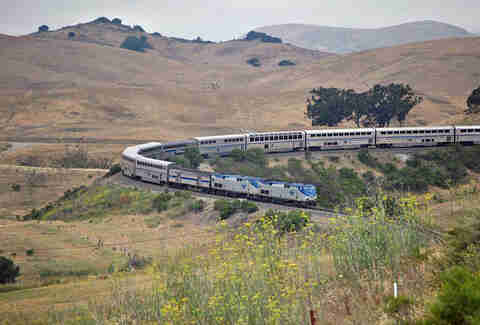 Be sure to grab a seat in one of the observation lounge cars so you can soak it all in. 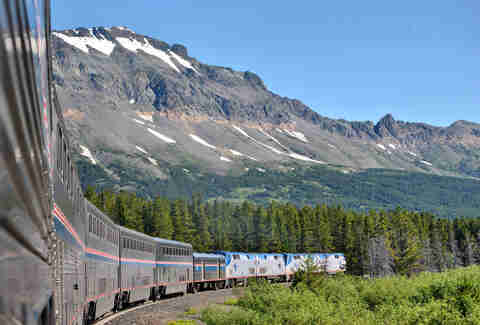 This train also takes you through Whitefish, Montana, the plains of North Dakota, along Lewis and Clark's expedition route, and through a seven-mile tunnel cut into the Cascade Mountains. Can you say "all aboard"? How much? Starts at around $175. But this is another 46hr adventure, so realize by the time you choo choo into your final destination you could've flown to Australia and back. And then back to Australia again.